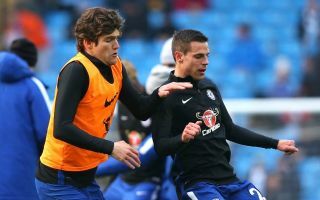 Chelsea youngster Reece James took a naughty dig at team-mates Cesar Azpilicueta and Marcos Alonso after the club’s 2-0 FA Cup defeat to Manchester United on Monday night. The 19-year-old defender, currently on loan at Wigan this season, looks an impressive prospect for the future after shining at the Championship club this term. However, he won’t have made himself too popular here as he has been seen liking tweets from fans calling for him to become first choice at Stamford Bridge. Among those tweets he showed appreciation towards was one highly critical of Chelsea duo Azpilicueta and Alonso, suggesting they’re finished at this level. It remains to be seen if James would really stand by that or if he was simply showing thanks for the messages from fans and perhaps didn’t read that particular tweet carefully enough. Either way, it’s actually hard to argue with as Alonso in particular has had a bad season for Chelsea, while Azpilicueta also seems to have gone backwards after a change to a new role under Maurizio Sarri.